Denis’ nemesis and corruption sleuth Elaine Byrne is coming home. 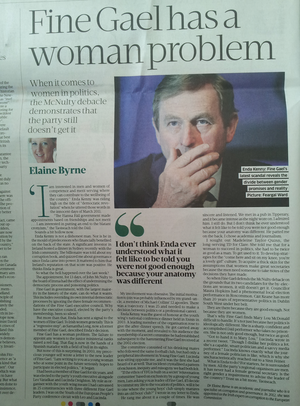 Posted in Misc and tagged Elaine Byrne at 1:23 pm on October 10, 2014 by Broadsheet. Good news for once about Irish media. Cue collective Clay Davis style “sheeeeeeeeeeeeeeeeeeeeeeiiiiiiitttttttttttt”s from Kildare St and county council offices around the country. Did she have a response beyond one tweet saying “Impressed that he’s apologised” or something to that effect? Like, Googling it all I can find is that tweet and a post from you back when you were PK also whining about it here on Broadsheet. She and you should get over your selective sanctimony. If her standards were so high she would have demanded that be be thrown out of Trinity.I can’t believe that she was “impressed” by him [the uber well-connected posh kid] doing the absolute bare minimum. Ireland the land of Universities with pizz poor academic standards and ethical standards to match. I didnt catch that one – and if that was her reaction I might tone down my joy a bit. Can we agree she’s better than most? Its Friday. I’ll accept a compromise. Oh look, it’s former YFG member Elaine Byrne. She’s sure to “wrangle” the large, sleeping majority. …nudge nudge…wink wink….Lucinda…watch this space. Carlow, minus Phil Hogan, plus Elaine – result!